Sticky Password Premium ist ein preisgekrönter Passwortmanager. Es erstellt, sichert, verwaltet und verschlüsselt starke Passwörter und hilft euch beim automatischen Ausfüllen langer Online-Webformulare. 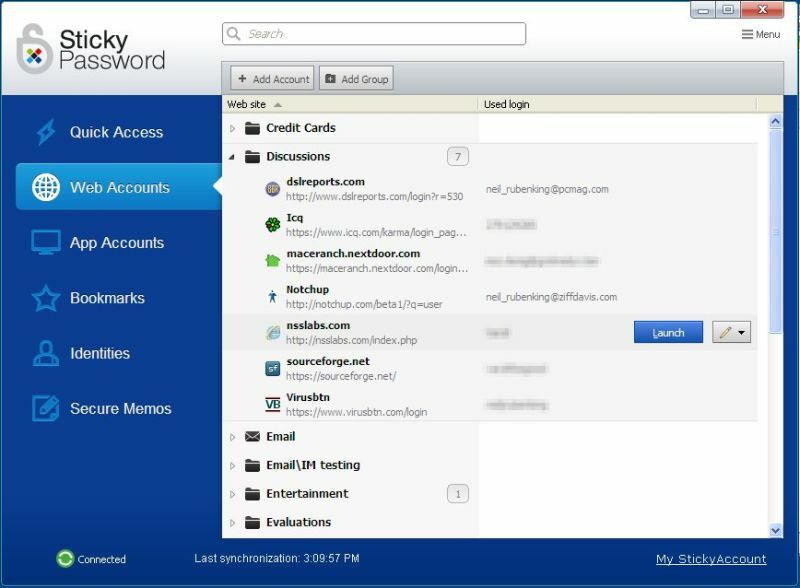 Sticky Password Premium 8.0.4 (Win & Mac) war am 13. August 2015! als Giveaway verfügbar! Sticky Password Premium ist ein preisgekrönter Passwortmanager. Es erstellt, sichert, verwaltet und verschlüsselt starke Passwörter und hilft euch beim automatischen Ausfüllen langer Online-Webformulare. Darüber hinaus könnt ihr eure persönlichen Daten schnell und sicher eintragen und speichern - mit Hilfe des Sticky Buttons. Keine nervigen Toolbars mehr! Darüber hinaus sichert es Daten mit Hilfe von AES-256 (Weltstandard der Verschlüsselung) und ist Mac, PC und den meisten tragbaren Geräten (Tablets und Smartphones) kompatibel. Das Tool unterstützt Windows, Mac OS X, Android und iOS. Ihr könnt eure Daten entweder über einen Lamantine Cloud Server oder euer lokales Wlan-Netzwerk synchronisieren. Eine Lizenz gilt für alle Geräte. Bitte beachtet: Diese Software beinhaltet eine Jahreslizenz. Sonderangebot: Lebenslange Lizenz mit 50% Rabatt! ($34.99 statt $69.99)! Mac-Benutzer können die Installationsdatei hier herunterladen (5.78 MB). Die Passwörter in der Cloud sind verschlüsselt, wo ist das Problem (zursache)? -@ Elke, wie wäre es erstmal mit einer Visitenkarte anlegen, dann füllt sich auch bei Bedarf, ein Formular aus. -@boeses Mädchen: Das Masterpasswort ist nicht in der Cloud, wird verschlüsselt auf dem PC gespeichert. Interessant was sich alles an Kommentaren und zum Teil Mutmaßungen zusammenträgt. Ich bin mir nicht ganz sicher in wie weit Sticky Password eine Bloatware ist. Laut Wikipedia: "Als Bloatware [...] wird Software bezeichnet, die mit Funktionen überladen ist bzw. die Anwendungen sehr unterschiedlicher Arbeitsfelder ohne gemeinsamen Nutzen bündelt." Ich konnte bislang nur Funktionen ersehen die alle in Richtung "Automatisches Ausfüllen" und "Sicheres (verschlüsseltes) Verwahren" gehen. Hierbei gehen keine Passwörter verloren, lediglich auf die Synchronisationsmöglichkeit und auf den Support kann man nicht mehr zugreifen. Man kann zwischen "Synchronisation Deaktivieren", "Lokale Synchronisation" und "Cloud Synchronisation" wählen. Bei z.B. der lokalen Synchronisation bleibt die Datenbank nur im eigenen Netzwerk und auch sonst wird die Datenbank jederzeit als verschlüsselte Datei gesichert. Wenn man bedenkt, dass dies die einzige Einnahmequelle ist und man das Produkt (sollte man keine Sync nutzen wollen) ebenso als Free Version verwenden kann, empfinde ich das Preis/Leistungs-Verhältnis (schließlich müssen die Add-Ons für die sich ständig ändernden Browser immer wieder angepasst werden) für angemessen. Hat jemand ein Beispiel für "Ausfüllen langer Online-Webformulare"? Habe bisher noch keines gefunden und dem tool ist auch keines beigefügt. Oh, jetzt ist mein Master-Password in der Lamantine Cloud verschwunden. Hoffentlich geben die das wieder her. "Bitte beachtet: Diese Software beinhaltet eine Jahreslizenz." Und was passiert nach einem Jahr? Muss man dann $19.99 bezahlen, um wieder an seine Passwörter zu kommen? Heute muss auch ich schmunzeln, ein Passwort-Manager als Bloatware mit 28,8 MB beinhaltet 1-Jahreslizenz für $19.99 oder lebenslange Lizenz für $70. Es wird immer trauriger hier. wird diese Seite bereit gestellt? (T.C.) Da weißt du alles. Elke gefällt das! Vielen Dank! Heute muss auch ich schmunzeln, ein Passwort-Manager als Bloatware mit 28,8 MB beinhaltet 1-Jahreslizenz für $19.99 oder lebenslange Lizenz für $70. Es wird immer trauriger hier. Ein Passwort-Manager mit Jahreslizenz, wohl den Knall nicht vernommen? Na ja, für wen wird diese Seite bereit gestellt? (T.C.) Da weißt du alles. Elke gefällt das! Vielen Dank! Installed and registered without problems on a Win 10 Pro 64 bit system. A clean install. A Czech company with names and address.
" We deal with security every single day. And we have for the past 13 years. Sticky Password is made up of former executives of AVG Technologies. This is more trustworthy in a sensible area than all of these companies "without names and address". Remember that this is again a 1 years license. Upon start you are guided through a 7 step process. You need an account on their server, you can synchronize with a "cloud account" on their servers. You should know, what this means in terms of security! You define your passwords select the browser integration, works also with the new Win10 Edge. If you really trust this procedure you can store now all of your passwords, bank account data, logins, security ID in this program. If you start this once, you will purchase the next years working program on August 2016. Does what it claims, you can use this as a proven password manager. Hello Kari, thanks a lot for your insight, we really appreciate that and we're happy you like the trustworthy of our team. We try to bring the best to security for the last 13+ years. Regarding the online account - we use it mainly for the purpose of activation so you can review your licenses online and also to give access to browsers you use and devices. If you choose so, you can sync only via WiFi or not at all and have all your passwords on your PC forever. We give the user the synchronization freedom. 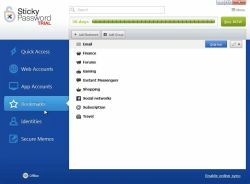 Sticky Password also has a free version. 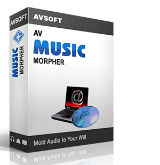 Check out this link to see the differences between the free and premium versions. This is a nice solution for password management. We have received previous versions in the past and they were generally well received. For me I will stick with Lastpass. It has always done well for me. Thank you GOTD team for your efforts and Lamantine Software for you offer. 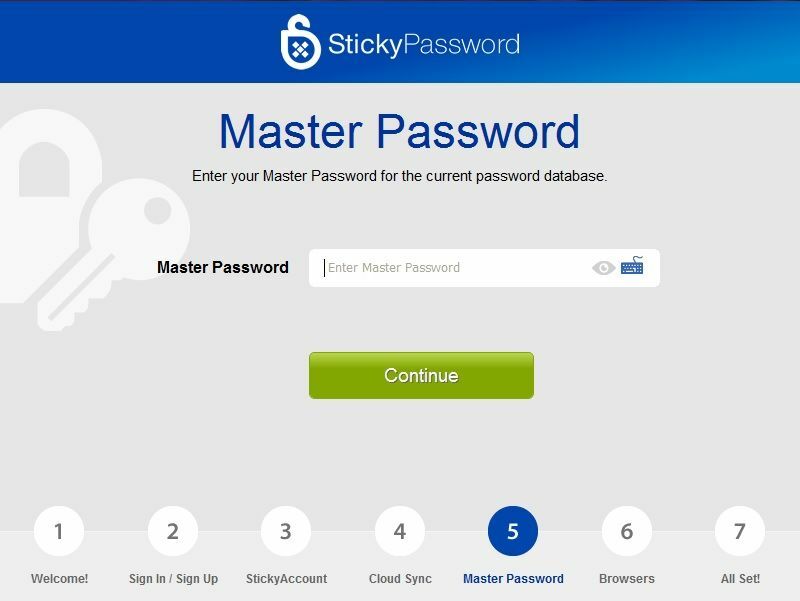 Sticky Password also has a free version. Check out this link to see the differences between the free and premium versions. https://www.stickypassword.com/free-password-manager-vs-premium This is a nice solution for password management. We have received previous versions in the past and they were generally well received. For me I will stick with Lastpass. It has always done well for me. https://lastpass.com/ Another alternative that is popular http://keepass.info/ Thank you GOTD team for your efforts and Lamantine Software for you offer. Hello, thanks a lot for the honest comment, we appreciate that. Glad Lastpass works for you too, it is important to adopt a good password hygiene, that is what we want everyone to understand. Have a great day. I can understand the convenience of this program but surely from a security point of view just having one password to protect all your passwords is dangerous. What works, works, I guess. You make a good point, however, I would estimate that 98% of security 'experts' would not only disagree with your viewpoint but would consider your advice irresponsible. The ideas behind password management programs are: (1) your passwords are stored in a strongly encrypted database that would be prohibitively difficult to decrypt even if someone managed to get access to it; (2) Since you only need to remember one password (the one that give you access to your database), you can make it an extremely strong password; (3) users should change their master passwords periodically. Now, obviously, if a person could keep every password he/she has in his/her head, the need for a management program would diminish, but since most people can't, this is the next best thing. I have over 160 passwords for different things (no way I'm going to try to remember them all), and I use Sticky password; I also use Dashlane, and I have no worries that I'm going to be compromised. Some people will use a program like this for most things, but NOT for their most sensitive data (like bank access credentials, etc.) That's understandable, but that doesn't diminish the efficacy of programs like this, unless you just prefer not to use them for your own reasons. Both Sticky Password and Dashlane are excellent programs. XP_Man What works, works, I guess. You make a good point, however, I would estimate that 98% of security 'experts' would not only disagree with your viewpoint but would consider your advice irresponsible. The ideas behind password management programs are: (1) your passwords are stored in a strongly encrypted database that would be prohibitively difficult to decrypt even if someone managed to get access to it; (2) Since you only need to remember one password (the one that give you access to your database), you can make it an extremely strong password; (3) users should change their master passwords periodically. Now, obviously, if a person could keep every password he/she has in his/her head, the need for a management program would diminish, but since most people can't, this is the next best thing. I have over 160 passwords for different things (no way I'm going to try to remember them all), and I use Sticky password; I also use Dashlane, and I have no worries that I'm going to be compromised. Some people will use a program like this for most things, but NOT for their most sensitive data (like bank access credentials, etc.) That's understandable, but that doesn't diminish the efficacy of programs like this, unless you just prefer not to use them for your own reasons. Both Sticky Password and Dashlane are excellent programs. The Best Kalkulator in den Markt für Ihre iPad, iPhone, iPod Touch. Shooting RPG! Hero's 2nd Memory (Hero2M).